I-Mix Reload is a full featured control surface compatible with any MIDI compliant DJ software. I-Mix Reload connects to any PC or Mac via USB and includes all the controls needed to make the most out of any DJ software: Touch sensitive jog wheels for vinyl emulation, cross fader curve control, 3-band EQ�s with kills, rotary effects controls, backlit buttons, and much more. 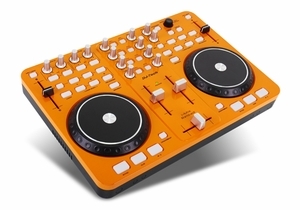 The package includes Traktor 3 LE and Deckadance LE. MIDI Mappings are available for other software including Traktor Pro.